The 2016 U.S. Young & Developing Dressage Horse Championships continued on Friday 26 August 2016 with the first round tests for the remaining two divisions, the 6-year olds and Developing Grand Prix horses. The combinations of Holger Bechtloff and Clapton JP and Endel Ots and Lucky Strike stood out amongst the fields to lead the Developing Grand Prix and Six-Year-Old divisions, respectively. Today’s tests counted 40% towards their overall scores. Fresh off competing in Europe, Ots (Wellington, Fla.) and Lucky Strike (by Lord Laurie x His Highness) came into the ring strong to put on a fashionable test. Max Ots’ Hanoverian gelding’s development is coming along, evident by the judges’ high scores across the test. They lead the six-year-old division after completing the Six-Year-Old Preliminary Test with an overall score of 8.64. “I was so happy with my ride. He really tried and was with me throughout all the work, and I really did not have to do much. The only thing I would change is I was riding a little more forward in the medium walk; I was being a little conservative. Once I relaxed in the free walk, he was good,” said Ots. After placing third with Fashion Designer OLD in yesterday’s Prix St. Georges Test, Parra (White House Station, N.J.) replicated similar success with his own Don Cesar (by Desperados x Manhattan) in the Six-Year-Old Preliminary Test. He and the KWPN gelding showed off a brilliant walk but had minor problems with the flying changes. They ended with an overall score of 8.28 for second place in the division. “He is an amazing horse. I have not done this test very much, and I had a slip in the half-pass, which is a shame when you have a nice horse, but I couldn’t ask for more. He gave me everything. I was thrilled with his walk; the trot and canter were amazing,” said Parra. Michael Bragdell (Colora, Md.) and Sternlicht Hilltop (by Soliman de Hus x Rascalino), Hilltop Farm Inc.’s Hanoverian stallion, presented a consistent test for third place They earned an overall score of 7.98. Bechtloff (Wellington, Fla.) and Clapton JP (by UB40 x Ramizo Z) performed well in the Intermediate II Test to earn a score of 65.132%. Despite arrhythmic one-tempis, Bechtloff was pleased with Peggy Mills’ 2007 KWPN gelding and leads the Developing Grand Prix division. “Today, he went forward very nicely; his extensions were good. All week I had the one-tempis in my sleeve, but it was the movement we lost completely today. We will go in on Sunday, and we will not try to push; we will go with what we have,” said Bechtloff. The 2015 Six-Year-Old Reserve National Champion combination, Jane Karol (Concord, Mass.) and her own Sunshine Tour (by Sir Donnerhall x Alabaster), had a nice test despite some tension. She and her 2007 Oldenburg mare trail Bechtloff with a score of 60.526%. “Sunshine is a very sensitive horse. However, she was right with me, and the mistakes were mine because she is so sensitive. I have been working with Scott Hassler the last few days on the trot half-passes, and I thought we did those well. I thought the last passage was much better thanks to the work in the last few days,” said Karol. 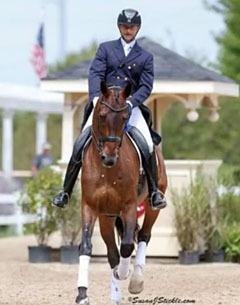 Noel Williams (Wellington, Fla.) and Sir Velo (by Sandro Bedo x Florestan), Melissa Mulchahey’s 2006 Westphalian gelding, are in third with an overall score of 60.526%.